It's taken Sky Sports F1 two years to get there, but they have finally found something to fill the hours and justify the existence of a dedicated channel for Formula One. The UK broadcaster announced today that they will be showing one Grand Prix from the archives every day from March 7th until the end of the year, making that 300 races aired by December. That clearly is an awful lot of nostalgia, and Sky F1 clarify that they will be showing GPs from the 1981 season onwards and that there "will also be themed weeks, with classic races to be shown of previous Grands Prix in the build-up to their 2014 installment." Sky aren't the first to come up with this concept, the BBC offered a selection of classic races ahead of a GP weekend and Sky ran with the idea after they picked up F1 rights. However, this is an unprecedented level of dedication to the history of the sport - something that F1 fans have long missed out on thanks to the organisers normally impenetrable archives. 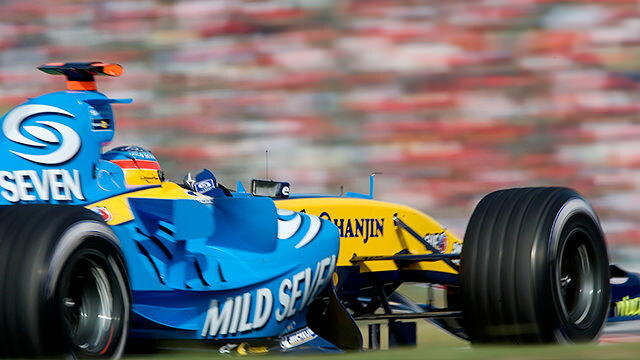 To celebrate the introduction of this new scheme, Sky Sports F1 have compiled a list of ten of the best races since the turn of the millennium and request fans to vote for their favourite. They promise to play the top three across the course of that first weekend. The ten races shortlisted are as follows. Needless to say I don't remember any of those, but when I asked Mr C to guess which ones they were, he only agreed with two of the choices. Every F1 fan is different after all. There have been over 200 races so far this century, narrowing it down to ten and then just three is quite a challenge. Which ones would you vote for, or which Grand Prix do you think is missing from the above list? Regardless of the opening weekend choices, this is a fascinating move from Sky Sports, considering they haven't seemed too concerned about the lack of content for their dedicated F1 channel in the past. This year they will have a certain ninety minutes filled every single day - with most airing at 21:00 in the UK, plus they gain the goodwill of nostalgic fans while they're at it. It will be interesting to see if this move convinces more fans to sign up to the paid service in the coming months. It has certainly got my attention. Previous post Formula E: The motorsports sandwich?